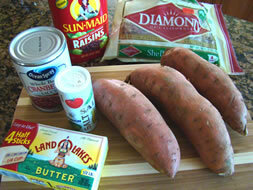 This recipe is the sweet sister of the baked potato boat! 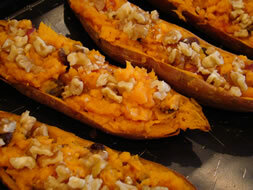 It also adds some great ingredients like cranberries and walnuts to amp up the flavor. Are you looking for something a little different as a side dish for this year’s Thanksgiving celebration? Or, maybe you’re just getting tired of bland white potatoes? 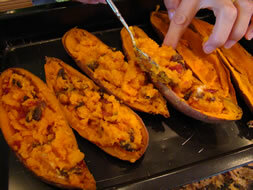 Well, this sweet potato recipe will awaken your taste buds and is sure to become a family favorite. 1. 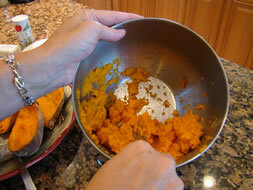 Wash the sweet potatoes well and pierce them several times each with a fork. Put the potatoes on the oven rack and bake for about 1 ½ hours or until a fork inserts easily and the potatoes are tender. 2. 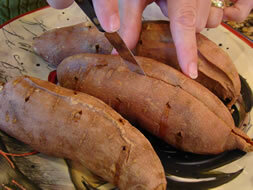 After the potatoes cool down a bit, cut them in half lengthwise. 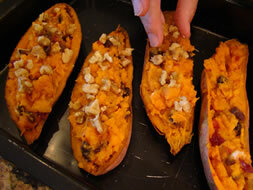 Scoop the cooked potato out of each shell, leaving about ¼” thickness of potato in the shell. This helps keep the potato shells rigid. 3. Mash the scooped out potato using a potato masher or a fork. Work towards a rather smooth consistency. 4. 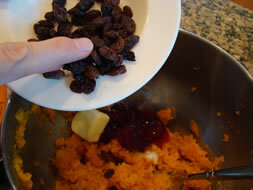 Stir in the cranberry relish, butter, salt and raisins until well mixed. 5. Once the potato and additional ingredients are well mixed, spoon the mixture into the potato shells. Place in a baking pan. 6. Sprinkle with the chopped walnuts. 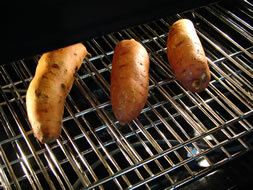 Bake for 25 – 35 minutes or until potatoes are heated through. The nice thing about this recipe is that you can make these ahead of time. On that busy Thanksgiving Day, who has time for all of this? Well, make these the evening before, cover them and refrigerate right in the baking pan! You will need to up the temperature to about 350 degrees and then bake for 35-40 minutes to ensure the potatoes are heated through. 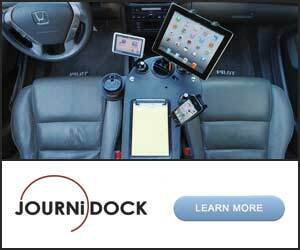 Just think – we may be enjoying these together this Thanksgiving. If so, let me know how the guests enjoyed them. I know mine will!! Hi, Shari. What’s cranberry relish? See in the photograph of the ingredients? There is an Ocean Spray can of Cranberry Relish. It’s kind of like a gel and it mixes in and adds some nice flavor.